New Delhi: Ministry of Skill Development and Entrepreneurship (MSDE) today announced an array of initiatives towards strengthening the skills ecosystem in India. The announcement was made by Shri Dharmendra Pradhan, Hon. Minister of Petroleum and Natural Gas and Minister of Skill Development and Entrepreneurship, in the presence of Shri Rajesh Agarwal, DG, DGT, Mr. Manish Kumar, MD and CEO, National Skill Development Corporation (NSDC), Mr. Kulmeet Bawa, MD, Adobe India and Ms. Prativa Mohapatra, VP, IBM Coinciding with the Teacher’s Day, on this occasion Hon. Minister also felicitated top 20 ITIs of the country. A total of 4811 ITIs were graded by an independent 3rd party. 1. To ensure standardization of training and learning across all programs, DGT has aligned its courses with National Skills Qualifications Framework (NSQF), a competency based framework. A comprehensive instructional trainer manual for imparting NSQF aligned training was unveiled. This will help create a standardized skilled workforce with high degree of horizontal and vertical mobility. 2. A tripartite MoU was signed between DGT, NSDC and Adobe India. The collaboration with Adobe will follow the launch of Adobe Digital Disha – a program focused on helping Pradhan Mantri Kaushal Kendras and ITIs leverage the power of Adobe Spark to integrate creativity and digital literacy into classrooms and curriculum, encouraging students to develop essential skills needed for jobs in the digital era. Adobe Digital Disha is expected to touch the lives of over 1 million students and teachers across India by the year 2020. 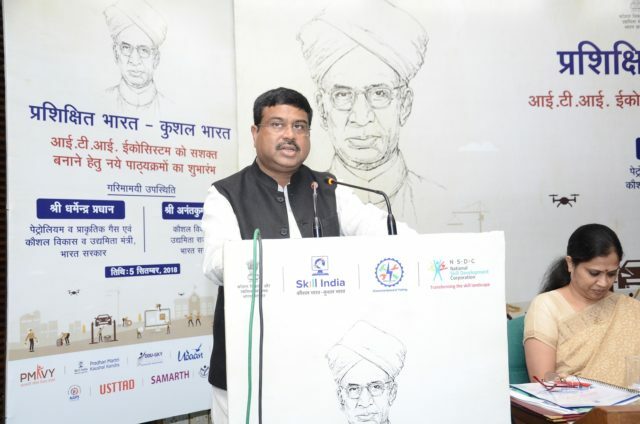 Shri Dharmendra Pradhan, Minister of Petroleum and Natural Gas and Minister of Skill Development and Entrepreneurship, speaking on the occasion said, “On the occasion of Teacher’s Day I congratulate all teachers who play an immense role in nation building through educating students. I congratulate the ITIs who have been felicitated today and commend them for the wonderful work they are doing to create a skilled workforce in India.